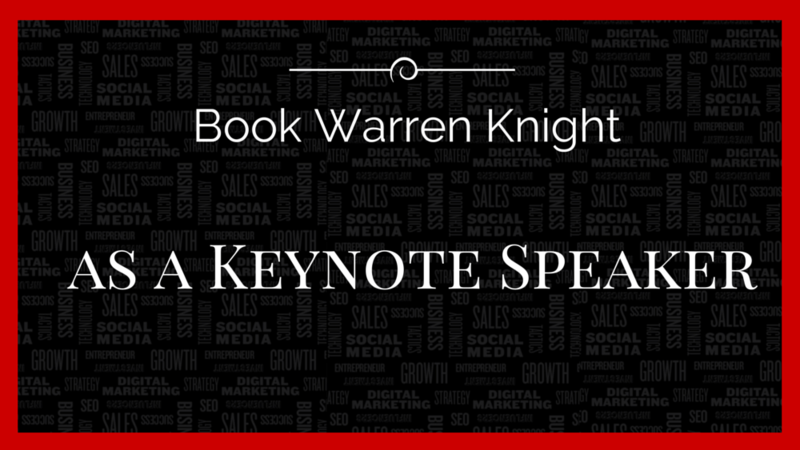 Warren Knight, author of Think #Digital First and an international keynote speaker is one of the UK’s most dynamic and sought-after inspirational Technology, Sales and Marketing experts. As a member of the Professional Speaking Association (PSA), he is also a trainer and coach, helping thousands of startups and SMEs build their digital footprint, increase sales by up to 500% and grow their business through social media, digital marketing and ecommerce. He also has a passion for helping entrepreneurs to upskill. If you are looking for an engaging speaker, to hold a presentation at your next tradeshow/event, Warren is the perfect fit for you. 100+ copies of Warren’s latest book Think #Digital First, personalised for your audience and co-branded with your logo. He will market the seminar/workshop and the book to his audience of over 25,000 online, plus his 7,000 email database. To find out more about Warren and see how he can add real value to your audience, please contact via the box below.